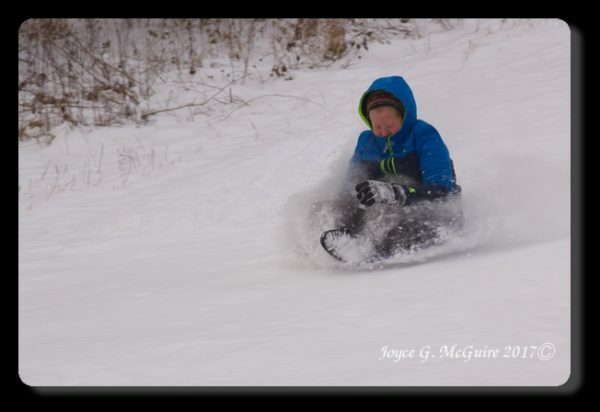 Today we went sledding for the first time of the year. 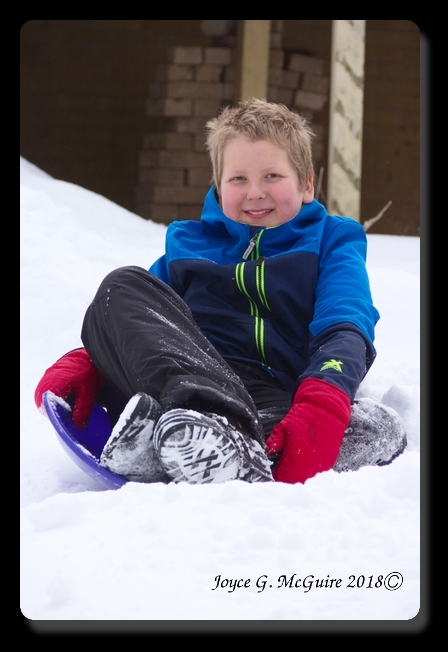 It snowed some yesterday and we wanted to go sledding so we tried at Ox-Bow park. 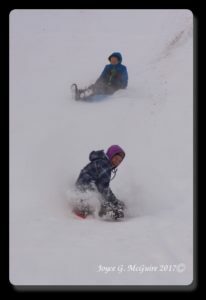 We went on the big hill and went down a few times, then we tried the smaller hill. That was a much better hill! We sledded more and Megan and I were able to go together too. 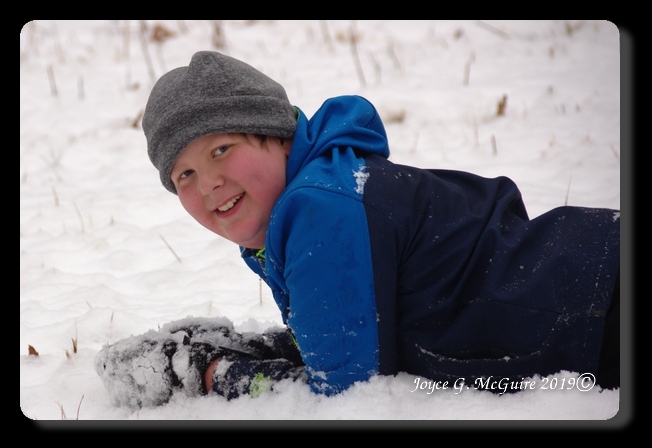 I hope it snows more so we can go sledding again soon. Today it snowed. 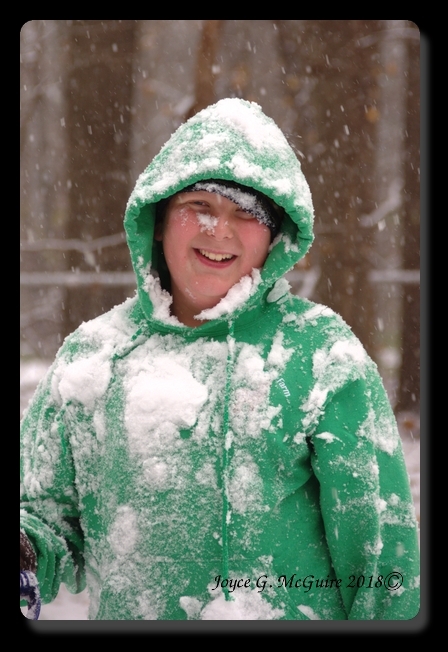 When we went outside, the Enemy (Andrea), the Neutral (Megan), and Agent 12½ (A.K.A Adrian) had a snow fight. The Enemy launched snow powder bombs in shovels and hurled it at Agent 12½, Neutral hit snow at both sides. Then Enemy and Neutral ran inside the hideout and closed the vacuumed air lock. I took a secret back way in. 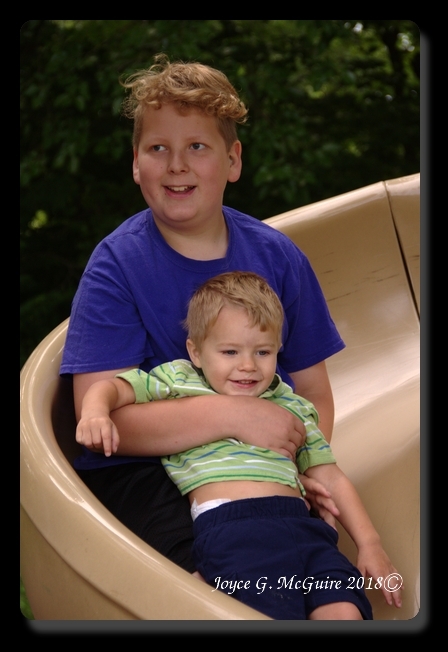 For a few weeks we babysat our cousin Jonathan when Grandma and Grandpa went on vacation. At first he was not happy coming over, but soon he had LOTS of fun and liked seeing the butterflies and goats. He taught us that butterflies say “Ahrrrrr”. We also went to the dump and he saw and talked about the birds and the trucks. Then we went to the library, Jonathan sat and looked at the fish with Audrey. 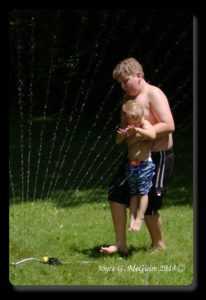 Another day we were playing in the sprinkler, Jonathan was having lots of fun. He liked running under the sprinkler when it made arches that you can walk through. He also enjoyed it when we dumped water over his head. Later we went to the park with him and played on the playground. He tried all the slides and climbed up a net-like latter. We went up the tower and Jonathan ran up and down the slope. He liked playing with bubbles, and when we left he was exhausted. I had fun being a babysitter in training. 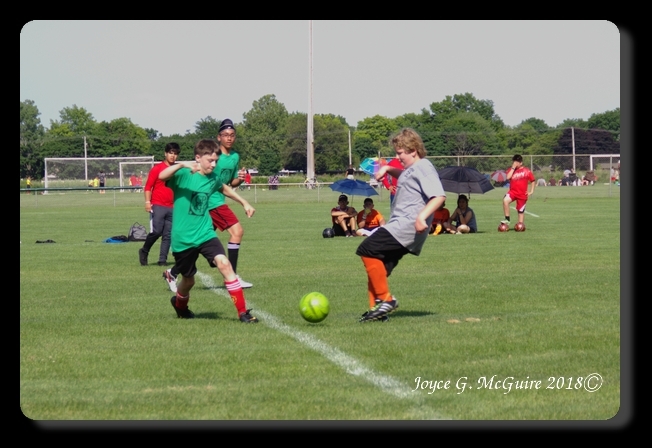 Yesterday we had our soccer tournament. Only four players of my team showed up. The game was hard but fun. My coach thought it would be good to give the goalie a break, so I got to be goalie. 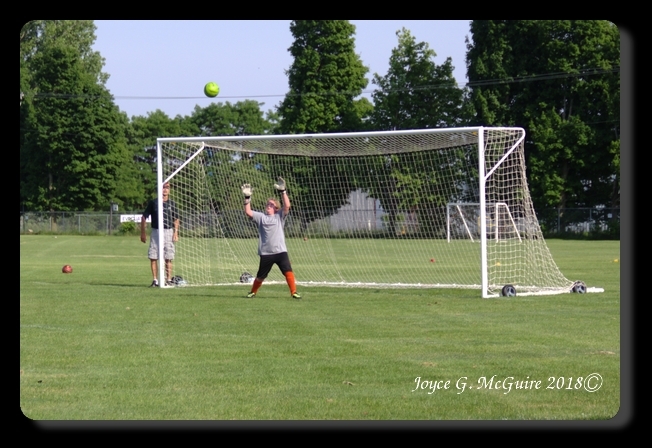 I have been goalie once before last year. Dr. Simon, a friend from church, coached me while we played. I got at least two balls out. We did not win but it was a good game even though we were quite hot and sweaty. Hope next year will be as fun! 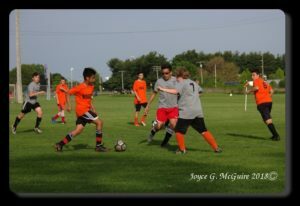 On Thursday we had a game, we either tied (6-6) or won (6-7). The ball went back and forth across the field. Once we almost got the ball into the goal, but it went on top of the goal and got stuck. The goalie had to jump to get the ball. I don’t know the exact score because of a crazy play our team made. The goalie came out of the goal to get the ball. 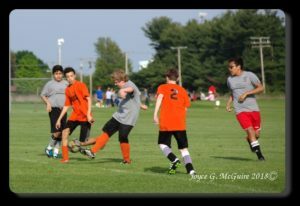 He missed the ball. 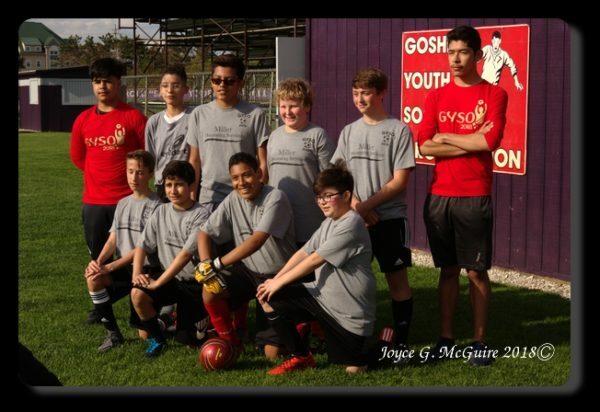 Our team came up, stole the ball from goalie, who was still not up from missing the ball and was not touching the ball in any way and made a goal. The referee did not count the goal and we can’t figure out why. Our coach said it should have been a goal and he did not know either. The other day there was a lot of snow! 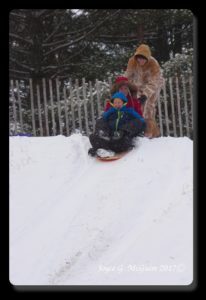 So we made a sledding hill. It was a short one because the snow got deep and it took a while to get far. The snow was soft and not packed well so I was one of the last ones to go on it. It is raining a lot now and there is a lot of water. It has almost melted. 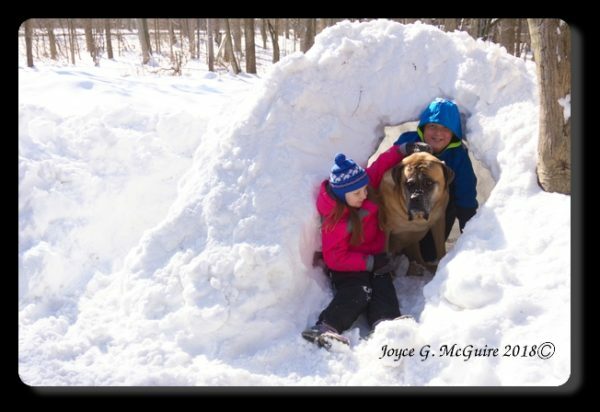 The other day Megan and I made a snow fort! The fort was made entirely out of snow.The snow fort was one of the biggest ones we made. It had two doors and was like a short hallway. Thor could even fit in it, it was that big! When he got in and sat down he would lick the sides. He also would also walk through it. Yesterday the snow started to melt and it rained a lot. Then the fort fell down 🙁 . 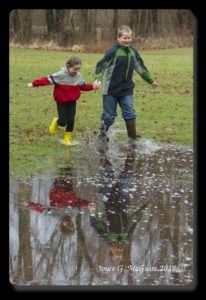 Today Momma, Megan, and I went to library and then the park and splashed in puddles because ­today is splash in a puddle day . 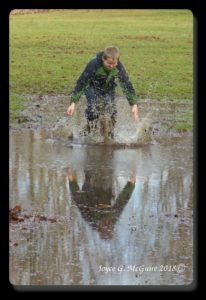 We found a large puddle and played in it for a while, we had lots of fun today and got very wet! We had a try to bump into momma contest, Andrea won! Momma moved out of the way just in time. When we where done we played King (Or queen) Of The Hill, this time Megan won. Then we went to see the river and there was ice on it. We made some snow angles on it. Then we went home and got some hot chocolate. 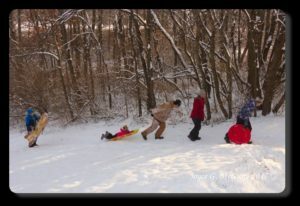 We had lots of fun on Christmas, we went sledding! Daddy got to go with us too! We had a lot of fun. 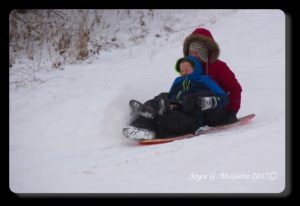 Momma and Daddy got some new red round sleds for us. I went really fast! It did not take very long to get to the end, Megan went the farthest. Posted by Adrian. Categories: Daily, gym class. 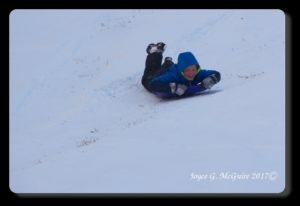 Comments Off on Going Sledding!